I remember the day my brother, Capt. Herbert C Crosby, U.S. Army, became a statistic, Case# , and was woven into that flag. That was in 1970, January 10, the tragic day he was listed Missing in Action in Vietnam. The POW/MIA flag brings unity for a common cause throughout our country, especially with our military, veterans and their families. It’s a symbol of hope. A reminder of those who gave their ultimate sacrifice for our freedom. My family’s lives, as all families who had/have a loved one lost, left behind, changed drastically, and forever. I thank God we were a lucky family. Lucky in a way I usually don’t refer to. I liken it to finding a needle in a haystack. That’s lucky. My brother’s remains were repatriated , identified  and buried in American soil in Arlington National Cemetery . I personally know two exPOWs and met many from WWII, Korea, and Vietnam. Their stories are shocking and atrocious. It was an honor to meet the exPOWs and hear them share their stories in 2010 at the National Prisoner of War Museum in Andersonville, Georgia. I still believe there are men still alive in Vietnam, although I can barely grasp the pure hell they would live. Many families are still waiting. We honor today those families, and the men and women who have not made it home. 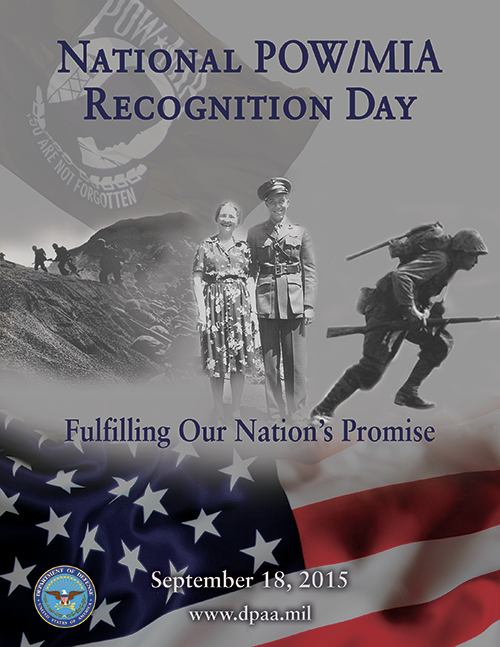 We recognize and support them, the citizens, and the government’s efforts to find and repatriate every single missing warrior. Quote | This entry was posted in POW/MIA and tagged National League of Families, POW MIA Recognition Day 2015, POW/MIA Recognition Day. Bookmark the permalink.